rec. live 6th November 2014 (op. 80; Bax); live 7th April 2016 Bridgewater Hall, (op. 77); studio 30th March 2016 Hallé St. Peter’s, Ancoats, (op. 42) Manchester, U.K.
For this new album the partnership of the Hallé under Sir Mark Elder continues its survey of English music with four rather neglected scores from Elgar and Bax. Linking all the works is the theme of ‘remembering the dead’. Deeply affected by the slaughter of the First World War, Elgar looked to Laurence Binyon’s collection of war poems The Winnowing Fan and chose to set three texts ‘The Fourth of August’, ‘To Women’ and ‘For the Fallen’. This Elgar requiem titled The Spirit of England was completed in 1917 and premièred in Birmingham the same year. The opening movement ‘The Fourth of August’ opens with surging orchestral splendour reflecting a positive sense of patriotic spirit. Soprano Rachel Nicholls is expressive and fully committed although her delivery feels slightly unsteady, straining to be heard over the orchestra. With the verse ‘Endure, O Earth!’ Nicholls sings marvellously and with rapt feeling. ‘To Women’ portrays the emotional impact the war was having on women at home with the dedicated Nichols singing with affecting sincerity. The closing movement ‘For the Fallen’ which I like to hear as a standalone piece, is movingly sung by Nichols with the choir convincingly expressing sorrow and remorse. In response to the call to raise money for charities in support of occupied Belgium, Elgar in 1914 wrote Carillon for narrator and large orchestra a setting of text by Belgian poet Émile Cammaerts. Given the remarkable success of Carillon Elgar looked again to Cammaerts’ text and in 1917 he composed Une Voix dans le Désert (A Voice in the Wilderness) a recitation, with a soprano soloist and orchestra. Cammaerts’ wife Tita Brand translated the French text into English however for this recording the narrator is using a revised translation by Geoffrey Owen. The sombre opening to the sound of a side drum immediately announces the martial credentials of the score. This is a striking portrayal of heart-rending despair contrasted with resilience and sense of hope despite overwhelming odds. Revealing his broad Northern English accent Joshua Ellicott narrates with clarity and just the right level of feeling for the text. Bright soprano Jennifer France conveys a stark lyrical beauty and although conspicuous her strong vibrato never intrudes. The play Diarmuid and Grania, a collaboration by George Moore and W.B. Yeats, was first staged in Dublin in 1901. At Moore’s request Elgar wrote three pieces of incidental music for a small pit orchestra an: ‘Introduction’ and ‘Funeral March’, and the song ‘There are seven that pull the thread’ for contralto voice. Yeats described the music as “wonderful in its heroic melancholy”, whilst Moore remarked that “Elgar must have seen the primeval forest as he wrote.” For publication with the title now reversed to Grania and Diarmid Elgar rescored the music for full orchestra which is the version performed here. In the Introduction the Wagnerian horn calls, followed by trumpets set a serious rather searching tone and striking too is the stark, eerie beauty of the writing. Making a remarkable impression is the keening clarinet solo over harp. Highly effective, the Funeral March contains a wearisome, heavy tread that unquestionably reflects an aching sadness. Coming unexpectedly, the contrasting central section has an uplifting regal theme so typically Elgarian. A highlight is the gloriously moving song There are seven that pull the thread sung with accomplishment by mezzo soprano Madeleine Shaw with a lovely, steady tone and displaying sincere feeling for Yeats’ text. 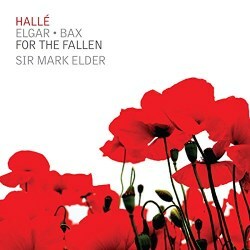 Sir Mark has previously released recordings of Bax’s Tintagel and Spring Fire with the Hallé. Now the partnership turn to Bax’s tone poem In Memoriam one of his least known scores. In Memoriam for orchestra from 1916/17 is contemporaneous with Tintagel, The Garden of Fand and November Woods all works that stem from the composer’s “Celtic Twilight” his period of infatuation with Romantic Celtic imagery and legend that lasted up to 1920. The inspiration behind In Memoriam was to commemorate the Easter rising in Ireland that occurred in Easter week 1916. According to musicologist Graham Parlett, a noted authority on Arnold Bax, the accompanying programme note is incorrect in stating that In Memoriam is an orchestration of the chamber work a sextet for cor anglais, harp and string quartet. In Memoriam was written in short score in August 1916 and the orchestration completed in March 1917. The sextet referred to, commenced in November 1917, originally titled An Irish Elegy was subsequently renamed as In Memoriam (1916). The Hallé engages deeply with the glorious and memorable music of this substantial work. Feeling slightly pastoral at times the score is full of deep introspection with an undertow of melancholy and anxiety. With playing as expressive has this it is easy to imagine in the contrasting forte passages that Bax was depicting a sense of courage and proud resilience against unjust oppression. Recorded in live concert at Bridgewater Hall and under studio conditions at Hallé St. Peter’s, Ancoats there are no problems whatsoever with the sound quality which is clear with satisfying presence and splendidly balanced too. Michael Kennedy, Richard Bratby and Andrew Burn wrote the interesting and helpful liner-notes. Congratulations to the Hallé label for providing full texts which includes the French text to Une Voix dans le Désert by Émile Cammaerts together with Geoffrey Owen’s English translation. The Hallé is on immaculate form providing playing of beauty and vivid colour with such fine control under Sir Mark. The natural feel to the flow and the sense of spontaneity are striking, together with successfully-held episodes of tension. It almost seems unfair to single out the string section for special praise but I do wish to acknowledge the remarkable sound of the strings. Nevertheless the Hallé could never be accused of having a bottom heavy sound because as usual the basses sound slightly recessed. On outstanding form the Hallé Choir achieve impressive unity with an especially attractive tone. Containing the theme of ‘remembering the dead’ and the image of poppies on the front cover one wonders why this album wasn’t timed for release around Armistice Day in November. This is a desirable album with the Hallé lavishing great care and attention on these generally neglected works, which deserve to be heard by a wider audience.